three-quarters (73 percent) of finance executives surveyed said their influence in supporting strategic decision making has increased in the past two years. Finance executives deal with a number of responsibilities today in addition to traditional tasks like budgeting and forecasting. Many organisations rely on outdated technology for their budgeting and forecasting, resulting in a lengthy and costly process. 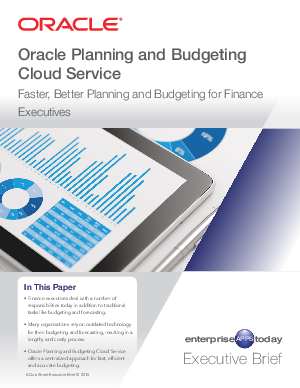 Oracle Planning and Budgeting Cloud Service offers a centralised approach for fast, efficient and accurate budgeting.